Born in Mexico and raised in Brasil, Khotan is one of the most promising artists of international projection of the moment. From appearances in Uomo Vogue to every fashion and music magazine throughout Latin America, Khotan has done work as an international model for such designers as Armani & Ralph Lauren as well as numerous catwalks and TV commercials. After attending dramatic workshops he was offered his television debut in "The Guilt" for Fox/Televisa co-starring with George Hamilton. 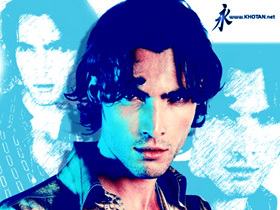 Khotan soon became one of Latin America's leading men with his role as "Mercurio" in Mi Pequena Traviesa, "Ransel" in Preciosa, "Humberto de Astolfi" in Amor Gitano and most recently "Pablo" for Telemundo/Globo the first Brazilian production aimed at the latin community in the U.S., bringing him critical raves and various international awards for best actor not to mention many other appearances in TV, films and shortfilms as well as the leading role in the musical "A Go-Go". Now stronger than ever Khotan enhanced his reputation as a singer and will burst onto the music scene with his debut album "Horizonte de Sucesos" recorded in L.A and produced by Khotan, Max Di Carlo (Martha Sanchez, Lynda, Uff, Sentidos Opuestos, Eros Ramazzoti) and collaborations by Alejandra Guzman, Marcello Zini, Alberto Giurati, and Cesar Balducci. click for more info This album features electronic grooves, rock pop mid tempo songs, heart-stopping ballads and party anthems, creating an original and different approach for the latin market music industry.